This post first appeared as “More Mayim! Actress Does Conan” on The Shmooze blog at the Forward. 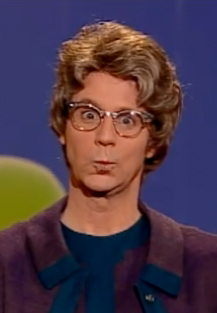 Mayim Bialik told Conan that Dana Carvey's "The Church Lady" character was the inspiration for a character she played as a child. More Mayim! Our favorite actress, neuroscientist, vegan and “attachment parenting” expert was on Conan O’Brien’s show talking about how she helps keep the scientific facts straight on her show, “The Big Bang Theory.” While she was at it, Bialik also reassured Conan’s other guest, comedian Dana Carvey, that his teen sons’ lack of impulse control is completely normal…at least statistically speaking. Dressed in a stylish, yet tsnius-conscious printed wrap dress, Bialik told Conan that she modestly lists “PhD in neuroscience from UCLA” in the “miscellaneous” section of her acting resume. She said she simply didn’t know where else to put it, so she put it there…where other people list random talents and hobbies like juggling, as Conan suggested. This post first appeared as “Passover Clean-Up Goes Online” on The Shmooze blog at the Forward. Passover cleaning ain’t what it used to be. To be sure, many Jews are engaged right now in the traditional sweeping, scrubbing and washing to rid their homes of chametz. But it seems that young singles are trying to unload themselves of unwanted leavening—that stuff that spiritually weighs you down—in an entirely different way. They’re de-friending people on Facebook and deleting contacts in their cell phones.